Alchemy….a synergy of two styles culminating in a musical panorama – Carnatic music blending with jazz, yet retaining its traditional charm! 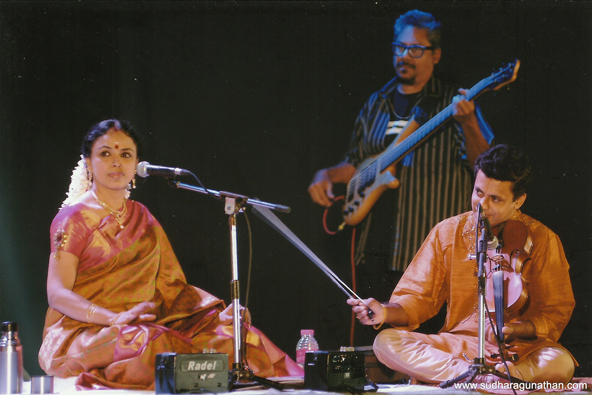 The evening of 22nd August, 2011 saw Sudha Ragunathan & Amit Heri offering ‘Alchemy’ for the Times Festival at Chennai. The colorful stage was further embellished by a medley of instruments, merging the east with the west…the base guitars, the drums, the mridangam, the vioilin and the ghatam, handled by seasoned stalwarts, Karl Peters, Jeoraj Stanly George, Thiruvarur Vaidyandathan, Embar Kannan and Giridhar Udupa. ‘Collaborating with Amit is a smooth sailing voyage. We discuss, argue, disagree, rethink and then arrive at a format. He gives me a lot of space to improvise and innovate’ says Sudha about this project. ‘When `s r g m and do re mi fa’ blend into a single melody, the music that emanates from that amalgamation is so unique and different with a flavor of its own’. Sudha continues…’We realized that the new sound we brought as an amalgam was very welcome among the non-Carnatic group and youngsters, so we thought we should do it as a live concert’. And true enough, the turnout was a cross section of music lovers, young and old, who seemed to have welcomed this packaging and conveyed their appreciations through generous applause.